Dwarf Tortoise Conservation (formerly Homopus Research Foundation) is a non-commercial foundation run by volunteers. The aim of the foundation is to gather and distribute information on Chersobius and Homopus species, to facilitate their survival in the wild. This aim is achieved through scientific field studies, and through the development and study of captive populations. Our results are published in scientific and popular outlets. 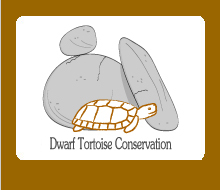 Annual report Dwarf Tortoise Conservation 2018! Opportunities to involve in tortoise fieldwork in February-March 2020!